I never thought minimalism could be so unexpectedly hilarious. 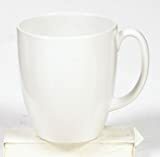 This cool new Mug™ Mug from designer Andrew Neyer is a white ceramic coffee mug with a creative, simple, and self-explanatory saying on its side that's in bold black letters... Mug™. Genius! 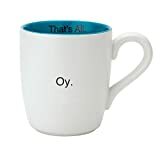 It is what it is and it proudly says what it is, a mug. Sure to bring a little deadpan humor to your mornings and be the hit of any office break room.